Jack Kirby’s Bronze Age series, Kamandi, Last Boy on Earth (cover by Kirby, all rights remain with current holder) is a good comic — heck, after Kirby’s “Fourth World” books wrapped up, this and Eternals at Marvel are the only Kirby work I thought was any good. But it’s also interesting to look at for (though I doubt intentionally) having a protagonist who’s not in any sense a Chosen One. Kamandi was a riff on Planet of the Apes, a post-apocalypse world where homo sapiens existed as animals while the former animals ruled. Not just apes but tigers (a civilization modeled on ancient Rome), rats (running a crime ring out of sunken NYC), lions (a relatively advanced society in the Southwest) and dolphins (aquatic civilization, of course). Kamandi grew up inside “Command Bunker D” (hence his name) with his grandfather, sheltered from the world. Until a wolf raider penetrated the bunker and killed his grandfather. Now Kamandi’s out in the world, endlessly moving, looking for people like himself (it turns out there are a few), helping out where he can. What made me frequently dissatisfied with the book as a kid was that Kamandi was often a passive participant in his own book. He’d run into trouble — giant gorilla, rat kidnappers, leopard pirates — but most of the time someone else would get him out of it, such as the lion Sultan or the human mutant Ben Boxer. Kamandi was the lead character, I wanted him to be more of the hero, and he wasn’t. Though I noticed when I reread the series a few years earlier that he does more than I thought at the time: in one issue he averts a bloody battle between tiger and gorilla forces by convincing them to resolve things with a game of chance. But generally he’s a POV character rather than a hero. Rereading the series, though, that’s part of what I like about it. Seriously, he’s a teenage boy trapped in a world he never made (as the old Howard the Duck catchphrase put it), it’s not surprising he’s out of his depth. He’s courageous and resourceful, but it works for me that he’s only able to make small changes here and there. He’s not the Chosen One destined to remake the world and restore humanity, nor the hero who triumphs over the world through sheer awesomeness, he’s Everyboy. It’s quite refreshing (and I say that despite liking lots of heroes who change their world through sheer awesomeness). I think this helps explain why the world often seems to real. Even as a kid, I got the impression these animal communities existed before and after meeting Kamandi: sure, meeting a talking, intelligent human cub was weird, but it wasn’t the defining moment of their existence, it was a colorful story they’d tell the family over dinner. The world didn’t revolve around him, so it had more space to be a world. I really appreciated this after Kirby left (#36 was his last issue) and other writers took over. The strange animal cultures stopped feeling real: they existed purely to be a menace to Kamandi and didn’t feel like they had any other existence. Some of the animals started seeing Kamandi as an existential threat that might lead to humanity reclaiming the world. 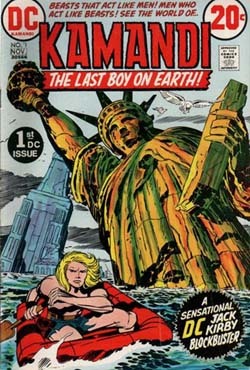 The final issue launched an arc that would have established Kamandi as indeed a Chosen One of some sort (the book ended first). In general, it was just not as good. So there is something to be said for not being a Chosen One or a mighty hero, but as my younger reaction to Kamandi shows, that often works against reader expectations. Which doesn’t always generate a favorable response. Most of the Kirby run is available in reprint so pick it up sometime (if you have the money to spare, they’re hardback reprint collections and not cheap) and see what you think.